Scientific Name(s): Cornus obliqua Raf. 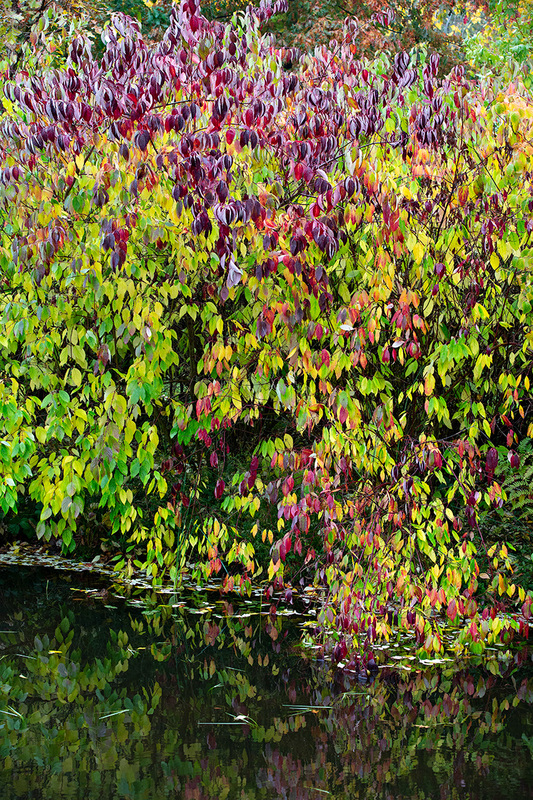 The common name pale dogwood presumably refers to the underside of the leaves, which are evident here in both the curled leaves that have turned purplish-red and many of the fallen leaves in the water. This photograph was taken in UBC Botanical Garden’s Carolinian Forest Garden in late October of 2017. I have my doubts that we will see such colour this autumn. Possibly due to the limited rainfall in the latter half of summer locally, many shrubs and small trees are barely producing anthocyanins. Instead, they are turning yellow or brown and crispy before falling, several weeks ahead of schedule. Cornus obliqua is native to much of the eastern USA and Canada, although its range does not extend into the southeastern states of the USA. Reaching about 5m (~16 ft.) in height, this shrub species prefers “alluvial woods, river and stream banks, wet meadows, marshes, ditches”; as you may note, these plants are planted in an ideal location within UBC Botanical Garden. Many references may place Cornus obliqua as a subspecies of Cornus amomum (and another), but the 2017 treatment of Cornus in the Flora of North America seems robust to me, so I’ve opted to follow their naming convention. Given that it was first published as a distinct species by the “softly blacklisted” Rafinesque, I wonder if there has been some longstanding bias (likely inadvertent in later works) against recognizing it as its own species. Additional photographs are available from the Friends of the Wild Flower Garden, Cornus obliqua; the epithet is also explained on this page, “[it] means ‘lopsided’ or ‘oblique’ and refers to the drupe’s stone pit which is of a lopsided shape, narrowed and pointed at the base”. That’s funny because here in the east with LOTS of rain, leaves are turning yellow/brown and falling early. On those trees and shrubs which have not already drowned or succumbed to root rot, that is. Awful season. Perfectly beautiful photo — I can imagine a sumptuous ballgown made from fabric showing this scene! I very much like the photo – and although quite ‘busy’ – it holds together due to the congregation of similarly-colored leaves in different parts of the photo. Though I just moved to Fidalgo Island, Washington, US, this summer, and am not familiar with the particularities of seasonal cycles here, I thought I noticed the same phenomenon you mentioned. Leaves are browning, curling, and dropping – and they’ve been doing that for weeks already. It’s especially noticeable on the red cedars. Your efforts last year made a beautiful scene, with the repeated shapes and rich coloring. This year I think we’re going to have to think differently! For sure one of the most beautiful photos I’ve seen on this site. Reminds me of Monet. Great work, Daniel. Unfortunately, we will never be able to judge the full extent of Rafinesque’s accuracy in naming new plants compared to modern identifications as his huge herbarium was destroyed after his death. Thank you for the inspiration of this gorgeous image!